Sinéad is the daughter of Johanna Marie O’Grady and Sean O’Connor (born John Oliver O’Connor). Her brother, Joseph O’Connor, is a successful novelist. Sinéad has converted to Islam, and changed her name to Shuhada’ Davitt. Sinéad is married to therapist Barry Herridge. She has a son with her former husband, record producer John Reynolds; a daughter with her former partner, journalist John Waters; a son with her former partner, musician Donal Lunny; and a son with her former partner, Frank Bonadio. Sinéad’s patrilineal ancestry can be traced back to her fifth great-grandfather, James O’Connor. Sinéad’s paternal grandfather was Thomas O’Connor (the son of William O’Connor and Margaret McDonnell). William was the son of Thomas O’Connor and Mary “Polly” Gavin. Margaret was the daughter of Bartholomew McDonnell and Margaret Carroll. Sinéad’s paternal grandmother was Ellen “Nellie” O’Neill (the daughter of John Joseph O’Neill and Ellen Howlett). John was the son of William O’Neill and Catherine Devereux. The surname Devereux is of Norman French origin. Ellen was the daughter of William Howlett and Mary Newman. The surnames Howlett and Newman are of English origins. Sinéad’s maternal grandfather was Patrick O’Grady (also known as Seán O’Grady, the son of Thomas O’Grady). Sinéad’s maternal grandmother was Kathleen “Kit/Kitty” Roche (the daughter of Matthew Roach, later Roche, and of Johanna Kehoe). Matthew was the son of Matthew Roche and Catherine Alyward. Johanna was the daughter of Patrick Kehoe and Jane Duff. She converted to Islam, and changed her name to Shuhada Davitt. 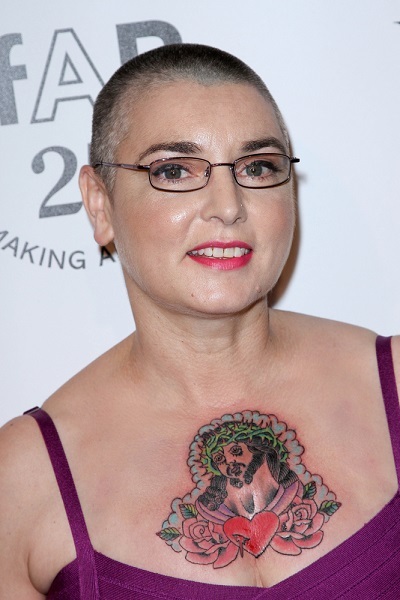 Sinead is the daughter of Marie and Sean O’Connor. Seán’s birth name is John Oliver O’Connor. Marie’s first name is Johanna. Sinéad is married to therapist Barry Herridge. She was previously married to record producer John Reynolds, until their divorce; to British journalist Nick Sommerlad, until their divorce; to Australian musician Stephen “Steve” Cooney, until their divorce. Sinéad and John has a son. Sinéad also has a daughter with her ex-partner, journalist John Waters; a son with her ex-partner, musician Dónal Lunny; and a son with her ex-partner, Frank Bonadio. Very pretty. Irish people originally came from the Iberian peninsula. Ahem – No it’s not. It you put in a link where you got that information from I’ll explain why it’s wrong. I presume you’re going off that old R1b study done about 15 years ago. No Irish don’t come from the Iberian penisula.